Whether you’re doing day-to-day cleaning to keep your home or business looking its best, or you’re looking at doing some deep disinfecting on a less frequent basis, you want to put some thought into the chemicals you use around your family and pets – especially since those harsh chemicals aren’t too friendly to our mother earth. 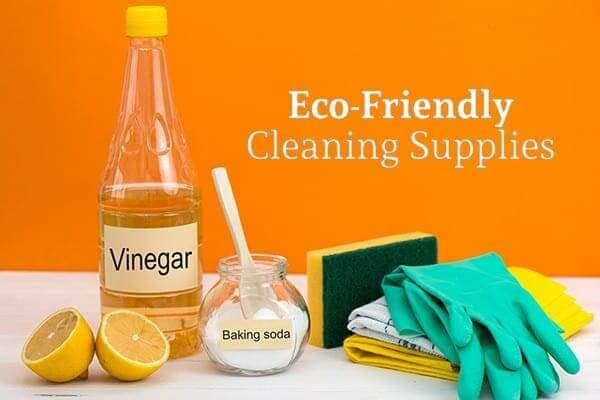 We’ve put together a guide to green, eco-friendly cleaning supplies you will want to keep on hand so you can feel good about how you dust, mop, polish and shine your home or business. Before buying a cleaner that claims to be eco-friendly, make sure you read the label and check to see that wipes are compostable, the packaging is environmentally sustainable, and chemicals and solvents are naturally based. An added bonus is that many of these green products are either fragrance- and dye-free or use natural scents and colors. Another option for eco-friendly cleaning is to shop locally. Check at local farmers’ markets or co-ops for locally produced cleaning products. This will require some research and effort on your part; not all of these products will meet your strict standards for environmental friendliness. If the artesian is on sight, don’t be afraid to ask questions and find out everything you can about the products. Not only will you be helping our environment, but you’ll support local commerce too. Baking Soda – While it’s often used for baking bread, it also scours, softens water, and deodorizes. Baking soda is a must-have green cleaning tool. Vinegar – Use it in place of window cleaner, but also to cut grease, remove odors, prevent wax build-up and even cut through mildew and mold. Mixing vinegar and baking soda creates a strong reaction that can be used to clean out a clogged drain as well. Unscented Soap – Plain soap flakes (or castile soap) is a good choice for cleaning just about anything. Mix an appropriate amount with water and make sure you rinse well. You may be surprised to learn that regular soap is biodegradable. Alcohol – Alcohol is a great disinfectant. Rubbing alcohol isn’t very eco-friendly, but mixing a bit of vodka with water is a good green solution to use for cleaning many surfaces. Vegetable Oil – Vegetable oil or olive oil is a good polish for wood. If you have access to cottonseed or hemp oil, these can be wonderful too. Hydrogen Peroxide – Use caution when using peroxide as it can bleach many fabrics, but peroxide is a good stain remover for floors, grout, and fabrics where bleaching isn’t a concern. Lemon Juice – Lemon juice is a good option for mild household cleaning. One of its strong suits is its smell. It can be a good choice for cleaning drains to make your kitchen smell fresh. While these ideas are certainly excellent eco-friendly tools to help you in your cleaning, sometimes it’s best to turn the task over to a pro. If you’re looking for residential or commercial cleaning assistance in the Arlington area, contact Love My Maids today. They are proud to use only the highest quality eco-friendly products that will make your home or office look its best. They look forward to hearing from you and helping you with your cleaning tasks soon!